All prices are in Canadian dollars. We use the total number purchased (ELM711P + ELM711SM) for the calculation. 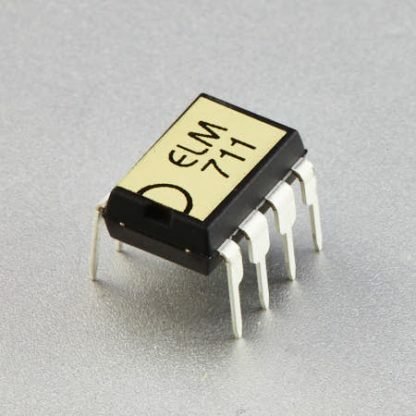 The ELM711 is a sequencing circuit that is typically used to control strings of LEDs for use on Christmas trees, or to attract attention on signs. Sixteen different patterns are pre-programmed into the circuit, and can easily be selected with the push of a button (and that same pushbutton also controls circuit on and off). No other external logic components are needed for the IC to operate, as all timing and control functions are performed internally. Each high current output is capable of directly driving an LED, but in order to drive a string of LEDs, a higher voltage supply and an interface circuit (often a transistor and two resistors) are required. See the Example Applications section of the data sheet for a short discussion on how you might typically use the ELM711 in a circuit. Note that this integrated circuit uses rapid PWM switching techniques to perform the LED dimming used by some of the patterns, which is not suitable for use with slow interface devices such as electro-mechanical relays.